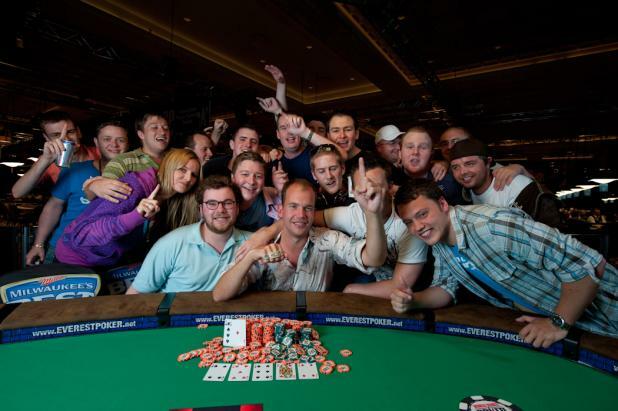 A day and a half after finishing the $50,000 Poker Player's Championship in first and second, Michael "The Grinder" Mizrachi (foreground, right) and Vladimir Schmelev entered Event #10 ($10,000 Seven Card Stud). 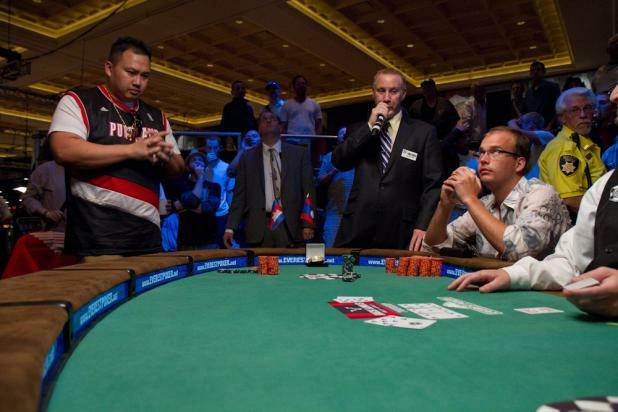 They both appear to be unstoppable as they make another high-stakes final table together. Before the final table started, Mizrachi went up to Schmelev and asked, "Why don't you and I go all the way to the final two again?" Schmelev, who doesn't speak much English, seemed to understand as he smiled and nodded. First the Photo, Then the Party. 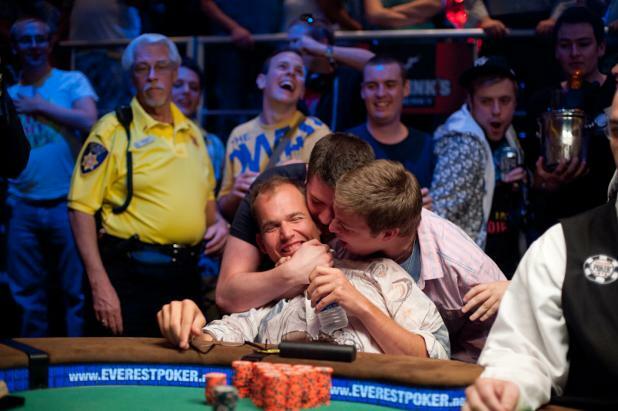 When the river card hit on the final hand, and Steve Chanthabouasy missed his straight draw, James Dempsey's friends on the rail nearly assaulted him with their congratulations. Steve Chanthabouasy (left) was all in preflop with A-7, but dominated by James Dempsey's A-10. However, the flop came 6-5-4, giving Chantahbouasy hope with an open-ended straight draw. Dempsey needs his hand to hold to win, while Chanthabouasy needs to catch an eight, seven or a three to survive. 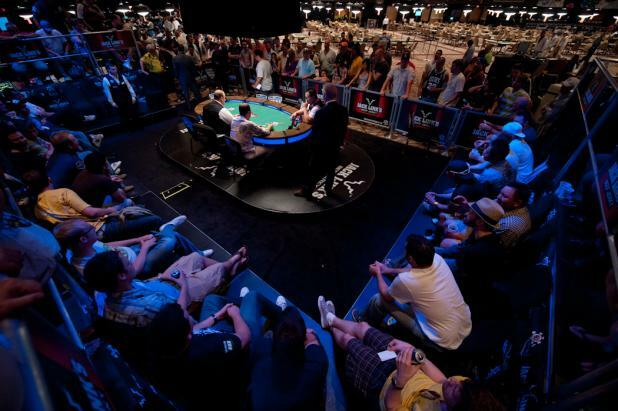 As is the tradition, the bracelet is placed on the final table when there are two players left, to remind them of what they are playing for. (Money is only put on the table for televised events.) Steve Chanthabouasy set up his miniature flags behind the bracelet, as if to stake a claim of ownership. James Dempsey lost his heads-up chip lead for a while before getting it back. 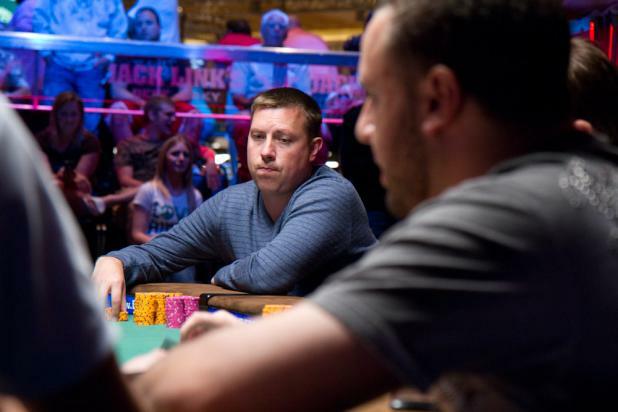 A 27-year-old poker player with a commercial pilot's license, Dempsey is trying to become the second British player to win a bracelet this WSOP. 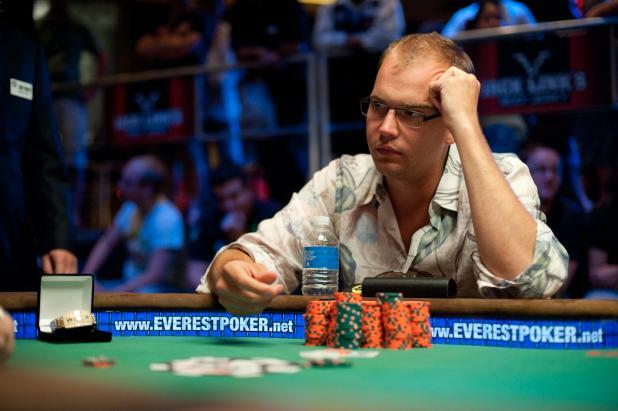 Steve Chanthabouasy began heads-up play with a 2.5-to-1 chip deficit, but battled back to take over the chip lead. 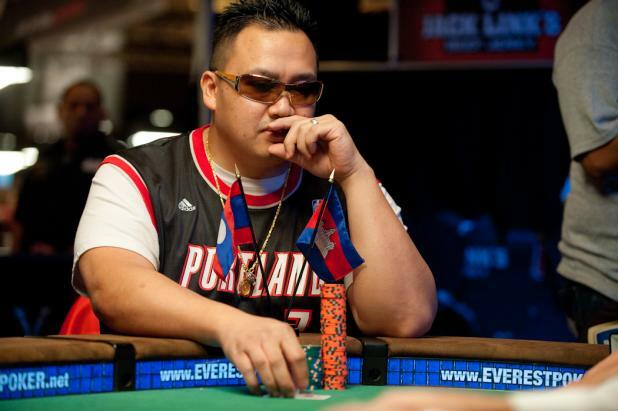 This is Chanthabouasy's first cash in a WSOP event, and he's guaranteed a top-two finish. 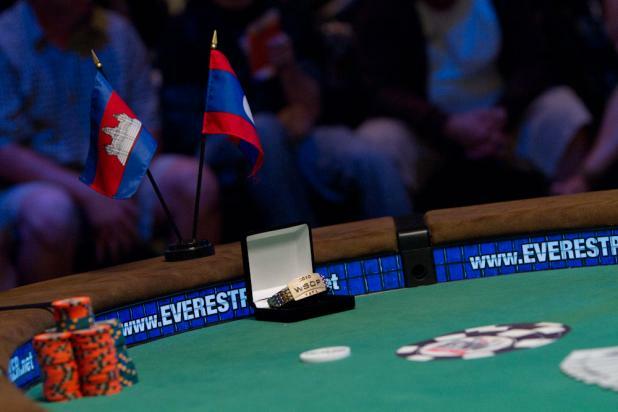 Chanthabouasy was born in Laos, and his wife is from Cambodia, and he kept the two flags from those countries by him throughout the final table. James Dempsey (next to the dealer) and Steve Chanthabouasy are heads up in Event #9 ($1,500 Pot-Limit Hold'em). 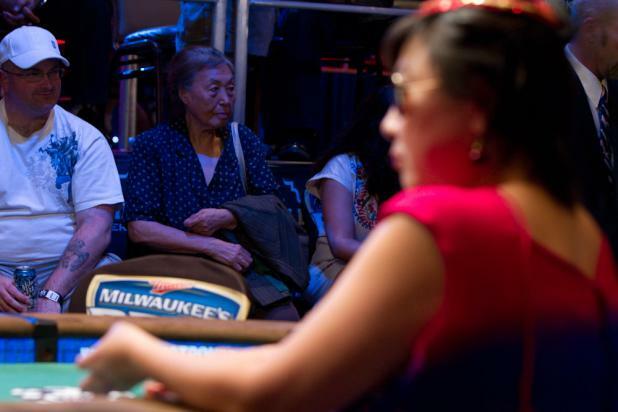 Joanne "J.J." Liu wins a pot here, but eventually she was eliminated in third place, earning $86,512. Joanne "J.J." Liu had a lot of friends and family on the rail supporting her, including her mother, who was hoping to witness history with four players left. 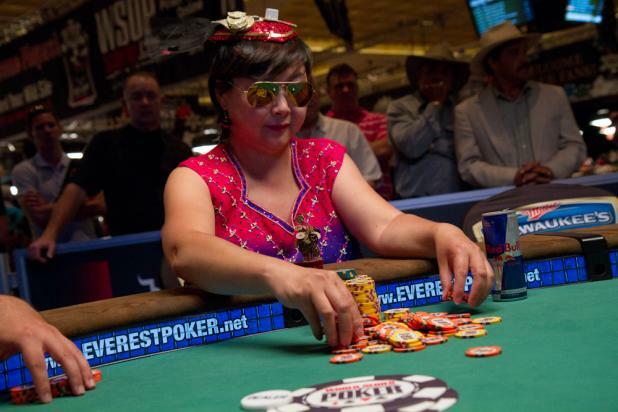 If Liu could emerge victorious, she'd become just the 15th woman to win an open WSOP bracelet.